UPDATED: The Jeff M. Bauman Fund has received so much support in the past 12 hours that we have exceeded our Goal of 500 Likes. GallowayTwpNews.com has agreed with the Bauman Family to extend this promotion making the Donation by GallowayTwpNews.com a Donation of $1,000. 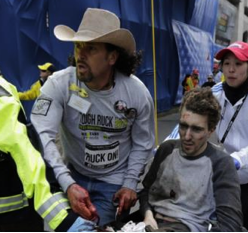 GallowayTwpNews.com will donate $1,000 to the Jeff Bauman Fund when GallowayTwpNews.com Page LIKES exceed 2,000. Supporters have already guaranteed $500 with the 500 Likes, LETS NOW MAKE IT $1,000. GallowayTwpNews.com is proud to announce our Facebook campaign to contribute up to $500.00 to the Jeff M. Bauman Fund. This campaign offers a way for everyone on Facebook to get involved and be part of this donation. "Galloway holds the heart of the Bauman family. Jeffery Bauman’s grandparents settled down here to raise their family and open Bauman’s Seafood restaurant, which thrived for over 30 years. It was a place so many locals loved and continue to remember" Courtney Bauman said in a statement released Tuesday night. A Benefit for the Boston Bombing Hero is being held on Sunday, May 26, 2013 at the King's Lounge/Christie's Bar located in Egg Harbor Township (old airport circle). GallowayTwpNews.com will donate $1.00 for every NEW Facebook "Page" LIKE on the GallowayTwpNews.com Facebook Page, up to $500.00. We currently have 693 followers on Facebook. We are looking to reach our goal of 1,193 followers by Sunday May 26, 2013 so GallowayTwpNews.com Publisher Lisa Tilton can write a check for $500.00 to the Jeff Bauman Fund. Share this story with all of your Facebook Friends. Visit our page and click LIKE to receive all the latest news and community updates for events. By doing so, we will donate $1.00 for your LIKE towards the Jeff M. Bauman Fund up to $500.00. Jeffrey Bauman's cousin Courtney, and her parents, Jeffrey and Terri Bauman, and her brothers, Tom and Zach Bauman, all from Galloway Township, are hosting the Benefit. "Our family is incredibly thankful to have the support that Galloway Township has given us. Our family, friends, local restaurants, bars and shops have been amazingly generous with their donations" said Courtney Bauman. "Come to Kings Lounge/Christie’s bar on May 26th any time after 2pm to support Jeff Bauman with a night of music, food, drink specials, and lots of amazing items for Chinese auction. Please come out and let us personally thank you for your love and support." Tickets are still being sold if you would like to attend the Benefit on Sunday.